The user experience can make or break a product. For this reason the creative talent behind it, specifically designers and front-end developers, are a hot commodity. There are a lot of useful resources out there to source these creative people just waiting to be found – dribbble, behance, scoutzie, github, cargocollective – but sometimes you can still come up short in finding the perfect candidate. Here are five ways I’ve successfully sourced creative talent, which might help you in your search. Talented people know other talented people. If you can, meet with all your new hires to educate them about your company’s employee referral program (if your company doesn’t have one, build one yourself). Ask for one or two referrals from everyone, and you’ve got a great list of people to work from (and they’ve already been vouched for). Don’t forget about external referral opportunities, too. How many times have you received a LinkedIn InMail response that says, “Thanks for reaching out, but I’m not looking right now”? When this happens to me, I always reach back out to thank them for responding, and to ask if they know anyone else who may be a good fit. 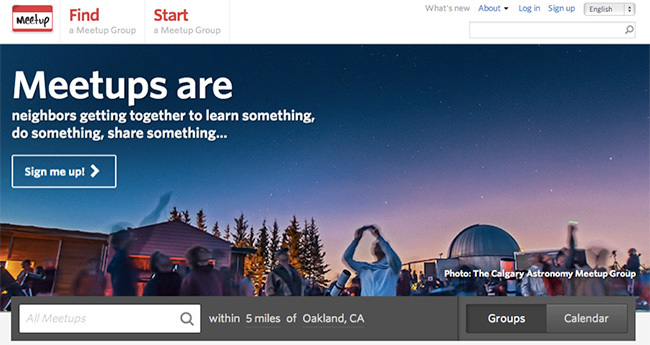 Don’t just join meetup.com or plancast – be sure to set email notifications for local events that are relevant to the positions you’re recruiting for so you don’t miss them. It’s true that recruiters aren’t always welcome at some meet-ups – but you can also plan your own event. Whether or not you meet potential hires, it’s a great opportunity for your company to make an impression. Creative people want to work for companies that will inspire them and give them ownership over their work. Inviting the greater community of designers and developers to your event shows how much your company values creative talent – which can also end up attracting them. Do you use Pinterest to find new recipes or experiment with DIY projects? Guess what – it’s also a great tool to find creative talent. 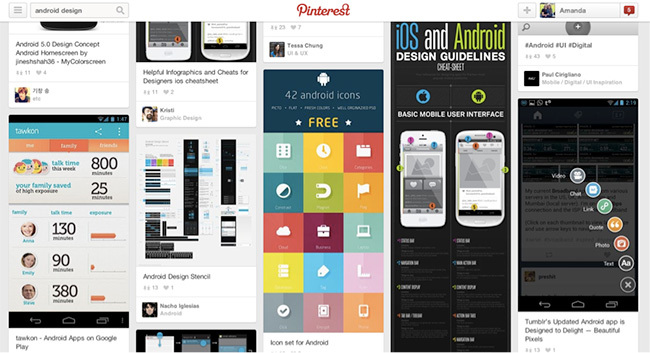 Designers and developers are using Pinterest in new ways to build their brand, and they’re posting more than just pretty pictures. 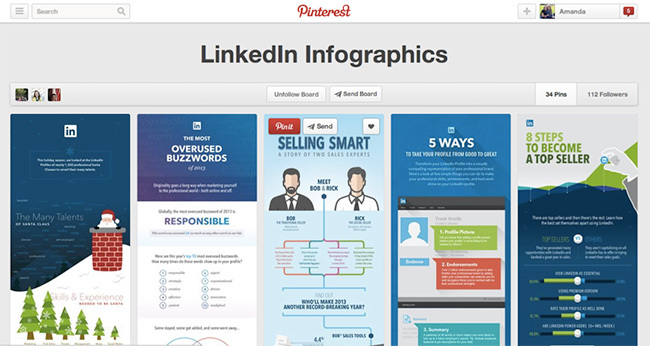 Members of LinkedIn’s Brand and Marketing Design Team, for example, post infographics they’ve created for LinkedIn. Whether designers post their own work or work that inspires them, skimming their boards can give you a good sense of who they are and their design style. Pinterest is also a great place to look for people with specific skills. If you’re on the hunt for an Android designer, search for Android apps and browse the results for the design style you’re looking for. 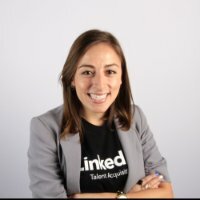 Once you’ve found someone, use LinkedIn Recruiter to see if you can dig up the designer that created the App and then send an engaging LinkedIn InMail. There are a lot of ways to keep up with the news and make sure you stay in touch with what’s happening in the industry you hire for. I like to use LinkedIn Pulse, a mobile news app that allows me to pick topics I’m interested in. I’ll also just search Google with terms like “The best designed Android Apps” or “The most used Android Apps of 2013” and see what pops up. 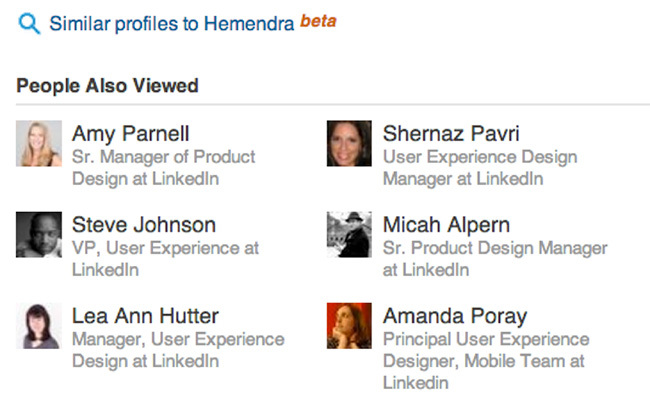 Once I identify the company responsible for a product I love, I find it on LinkedIn (LinkedIn Recruiter lets you search for companies as well as people), then I search for both current and past employees to find the right people behind the product. Features like “People also viewed” or “Similar profiles” can be a way to take this a step further and find people with similar backgrounds to your already qualified candidate. Last fall when LinkedIn was seeking a Creative Director to join our design team, I had to get resourceful. Although we had a lot of good candidates, we just couldn’t find a perfect fit. One morning on the LinkedIn Shuttle from San Francisco, I looked up and saw a billboard that caught my eye. It was clean and impeccably designed, and it left me wanting to know more about the company. When I arrived at work, I jumped on LinkedIn Recruiter to see what I could dig up. I searched the company advertised on the billboard, pulled up a list of employees, and eventually found the perfect candidate. He joined LinkedIn at the start of this year. Design is all around you. Whether it’s in the great user experience for an App you just downloaded or on a huge billboard on the highway – always keep your eyes open. Whether you try these ideas or come up with some of your own, finding new ways to source passive candidates is one of the reasons being a recruiter is so much fun. You never know where your next great hire might come from – so keep the employee referrals coming, keep your calendar full, keep your fingers typing, and keep your eyes peeled (for great billboards or anything else awesome that comes your way).